Insect cages made in the UK by Small-Life Supplies, including standard bee cages and stick insect cages, also bespoke insect cages. Provide the perfect home for your insects. From large airy cages to small hatching boxes, we create and manufacture cages to suit every insect. Stick insects do really well in the ELC cage because they can easily climb the white sides (these are full of specially made holes which give the insects a good foothold). These two mesh sides also ventilate the cage, making it nice and airy. The ELC cage is tall so the stick insects have room to grow properly (they do this by sliding vertically downwards out of their old skins). You can see the stick insects very well through the clear front and back plastic panels. The standard roof also has a clear plastic viewing area. It's easy to access the ELC cage. The roof lifts off and the white side (with the green arrow) slides upwards. So you can reach sideways into the cage as well as from the top. Keep the ELC cage clean by lining the floor with a disposable ELC Liner (these are available in blue and pink). Replace weekly. Small-Life Supplies launched the ELC cage in 2012 and it continues to be our best-selling stick insect cage. The ELC cage is supplied ready assembled, price £52.50. ELC cage bundle (includes ELC cage, cleaning sponge, Sprig Pot and ten blue or pink ELC Liners, colour stick insect information sheet), price £59.99. Delivery £9.95 (Would you like anything else? If you do, you won't pay any more delivery, it is capped at £9.95). 6 adult Australian Macleays Spectre stick insects (Extatosoma tiaratum). into the cage from the side. Stick insects can climb easily by hooking their claws around the white mesh sides. Keep the cage clean by lining the floor with a disposable pink (or blue) ELC cage Liner and replace this weekly. The ELC cage has a lift off lid (as well as one removable white mesh side panel). The TTQ cage has a small access flap on the lid, this is ideal for dropping in small insects. The lid also lifts off completely so you can reach downwards into the cage. Or, to reach sideways into the cage, just slide the solid side panel upwards (it's labelled with an arrow). 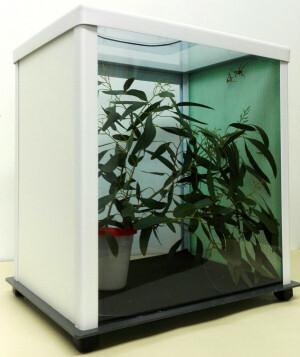 The TTQ cage only has one ventilated side, so it is ideal for those small species requiring less airy surroundings. Two versions of the ventilated side are available: the standard white mesh version and the extra fine green mesh version. Please contact us if you are unsure which version to choose. You can see the insects very well through the clear front and back plastic panels. The roof also has a clear plastic viewing area. Keep the TTQ cage clean by lining the floor with a disposable black TTQ Liner. Replace weekly. The TTQ cage is supplied ready assembled, price £44 (with the fine green mesh side) or price £42 (with the standard white mesh side). TTQ cage bundle (includes TTQ cage, cleaning sponge, Sprig Pot and ten black TTQ Liners, colour stick insect information sheet), price £52 (with the fine green mesh side) or price £50 (with the standard white mesh side). 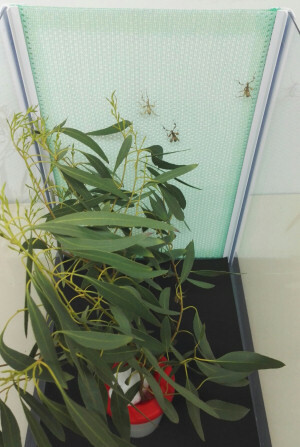 TIP: If you are keeping juvenile stick insects in the TTQ cage, be sure to move them to a taller cage as they grow, the ELC cage is a popular choice. Please contact us if you need further advice. TheTTQ cage version with fine green mesh side. 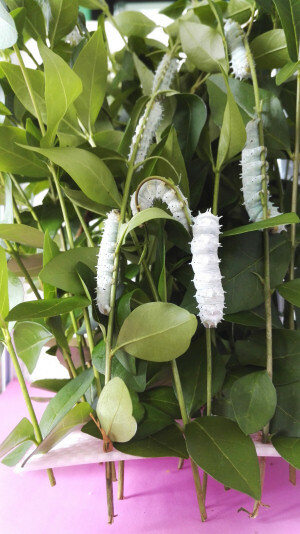 Privet Platform supporting privet and Indian Eri caterpillars. One side of the TTQ cage slides upwards. The AUC cage has four ventilated sides and so is a very airy cage. Stick insects which thrive in these conditions include the adult Pink Winged stick insects (Sipyloidea sipylus), Thailand stick insects (Baculum thaii), New Thailand stick insects (Baculum sp), North East Vietnamese stick insects (Medauromorpha regina), Grenadan stick insects (Diapherodes gigantea) , Australian Titan stick insects (Acrophylla wuelfingi) and Australian Macleays Spectre stick insects (Extatosoma tiaratum). 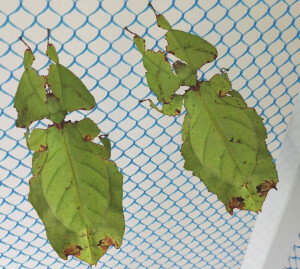 Many leaf insects also do best in very airy surroundings and these insects also benefit from being able to do short flights within the AUC cage. 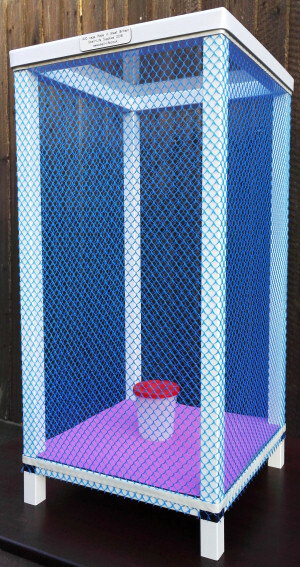 The very airy surroundings in the AUC cage are achieved by the large hole size in the netting, and so the AUC cage is designed for insects which are fully grown. The smaller nymphs (immature insects) should be housed in the ELC cage. The AUC cage has a drop on lid, just lift this off and then reach downwards into the cage. 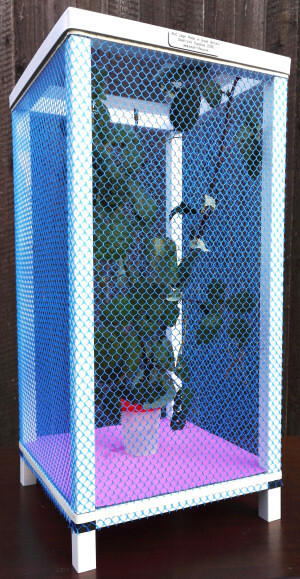 It's easy to mist the leaves with water, just hold the Mister Curvy near the outside of the cage and squirt the water in horizontally through the large holes. 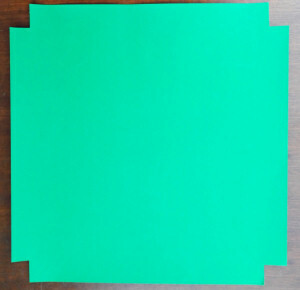 Every week, line the floor with a disposable AUC Liner, these are available in two colours; green and pink. The white frame is made from aluminium and so the AUC cage is strong yet relatively light and easy to move around. The lid and floor are made from strong plastic and so can be washed with warm soapy water (rinse well afterwards) to keep them clean. The sides are heavy duty netting with large holes. 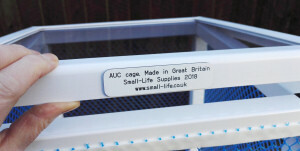 Small-Life Supplies launched the AUC cage in 2017. 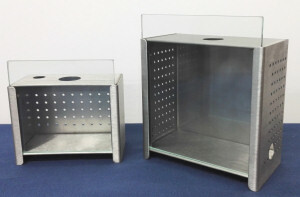 Materials: aluminium frame, plastic floor and lid, heavy duty netting. The AUC is supplied ready assembled, price £89. AUC cage bundle (includes AUC cage, cleaning sponge, Sprig Pot and ten green or pink AUC Liners, colour stick insect information sheet), price £97.99. TIP: It's important not to overcrowd stick insects, so we recommend housing up to 20 adult (ten pairs) of Thailand stick insects (Baculum thaii) in the AUC cage. Larger species need more space, so the AUC can house up to 8 adult (four pairs) North East Vietnamese stick insects (Medauromorpha regina). Please note that the AUC cage is not suitable for housing adult New Guinea stick insects (Eurycantha calcarata) because it is too airy for them and so these stick insects do best in the ELC cage. We launched the QBOX last century and it continues to be recognised as the best container for keeping stick insect eggs and small insects. The QBOX works because it is the optimum size and has no air holes. 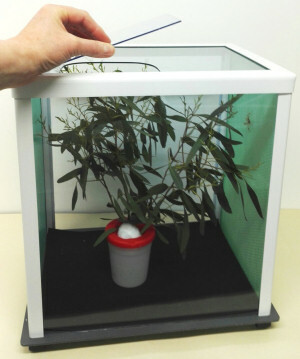 You can store stick insect eggs in the QBOX for months, leaving them to develop inside. You can see at once when they hatch out because the QBOX is made from crystal clear plastic. Small insects such as baby stick insects and caterpillars do really well in the QBOX. They benefit from the enclosed surroundings and have plenty of air to breathe. 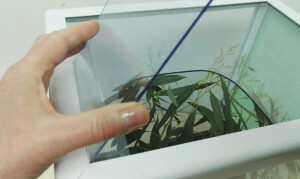 Fresh air enters the QBOX when you lift off the lid to insert a fresh leaf for the insects to eat. Always put a wet bramble leaf in the QBOX, so the baby stick insects can have a drink. Replace the QBOX Liner weekly, so they are kept in clean surroundings. QBOX Liners (pack of twenty) £1.20. The HUA pot was launched in 2015, designed for housing the larger species of newly hatched stick insects (for example New Guinea, Malaysian and Australian Macleays Spectre) which need more space than the QBOX. The HUA pot is also great housing for caterpillars and small mantids. The HUA pot has no air holes. You can store stick insect eggs in the HUA pot for months, leaving them to develop inside. You can see at once when they hatch out because the HUA pot is made from crystal clear plastic. Fresh air enters the HUA pot when you lift off the lid to insert a fresh leaf for the insects to eat. The lid is a push fit. Line the floor of the HUA pot with a tissue thin HUA pot Liner and replace very few days. HUA pot Liners are sold in packs of twenty and a random mix of colours shall be sent. Delivery 1- 3 HUA pots £3.95. Delivery 4 - 30 HUA pots £9.95. (Would you like anything else? If you do, you won't pay any more delivery, it is capped at £9.95). Our bee study cages are being used worldwide to help in the important work to save bees. Made from stainless steel, these small cages are easy to sterilise and keep clean. 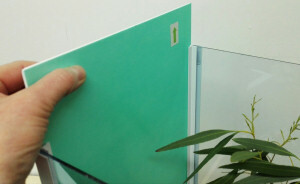 Access is via the front sliding glass plate (this has polished edges which are not sharp). The bee study cages are made to order. Two sizes are available, if you require extra holes or different sized holes, please let us know. The standard Bee Study Cage has two holes of the roof (10mm and 16mm diameter). The 2mm diameter ventilation holes can be on the base or back (you choose).Syringe rings are available to secure the syringe in place. Syringe rings are available in packs of 50, price £12.40 per pack. The larger Bee Study Cage has one hole of the roof (16mm diameter). The 2mm diameter ventilation holes are on the two sides. A 12mm diameter hole is on the side.Syringe rings are available to secure the syringe in place. Syringe rings are available in packs of 50, price £12.40 per pack. Minimum order 50 bee cages. Delivery Express delivery is capped at £9.95 by courier to mainland UK (but see exceptions below), weekdays only. We shall let you know by email when the delivery day will be. Standard delivery is by first class post to anywhere in the UK. International delivery is by airmail courier, using a trackable service, usually FedEx or DHL. VAT Prices include 20% VAT unless otherwise stated. A receipted VAT invoice shall be sent to educational establishments and companies. European customers need to tell us your VAT number when ordering cages. The Small-Life Supplies VAT number is GB 473 5005 60. Small-Life Supplies,Bassenhally Road, Whittlesey, Peterborough. PE7 1RR.